Bharat Sanchar Nigam Ltd (BSNL) Competent authority has announced to Launch of under WiMAX (Wireless Broadband Services) with 4 new Unlimited tariff plans. BSNL started Unlimited use of Wireless Broadband (WiMAX) with speed ranging from 512 Kbps to 2 Mbps for four plans under Home and Business users starting from Rs. 7500 for 12 months. The abvoe plans are 'Advance Rental plans'. 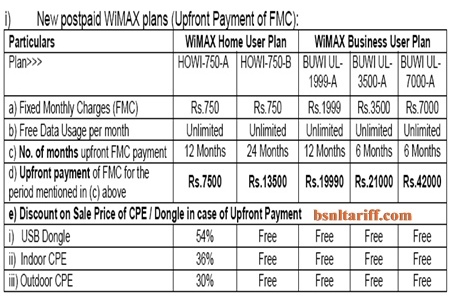 BSNL announced Discounts on FMC and also on MRP of WiMAX USB Dongle, Indoor CPE and Outdoor CPE (Customer premises Wimax Access Equipment) for low-end users. While for high-end plans all charges for USB Dongle and Indoor/Outdoor CPE will be waived off or not applicable. The Upfront Payment of FMC above mentioned is exclusive of Service Tax, which will be charged as per prevailing rates. The above Wimax bsnltariff will be applicable with effect from 08-011-2011, according to the BSNL Telecom circles technical feasibility. All other terms and condtions will be remain the same.